The deployment of high-density racks of equipment is creating power and cooling challenges for many data centers. The server densification trend is intended to create efficiencies in floor space, cabling, and systems management. However, the growth in power density (Watts per U) with each new server generation is causing data centers to limit rack utilization based on their present cooling capacity. Many data centers are in dire need of new cooling solutions to reap the benefits of server densification. This type of a solution incorporates modular fans and air-to-liquid heat exchangers to remove the high levels of heat generated by advanced server and mass storage systems. A water-chilled, closed-loop cooling system allows a data center to add computing power with minimal impact on the facility’s heat load, thus extending the life of the data center. This article explains the densification trend that is driving the need for direct cooling at the rack level, and it describes the operation and installation considerations of a water-chilled, closed-loop cooling system. Originally, data centers were designed to support large, water-cooled mainframes that consumed lots of power and generated intense heat in concentrated areas. As enterprise computers evolved, data center designs changed to support racks of multi-processor servers and storage systems that spread the power and cooling requirements over a larger area. Although this trend allowed data centers to scale easier, it created power distribution, cabling, and system management challenges. The emergence of 1U servers and blade servers allowed organizations to consolidate their data center infrastructures, decrease cable clutter, and streamline server management. However, most data centers are having difficulty adjusting to the effect of high-density racks on power and cooling resources. A fully loaded 42U rack with dual processor (2P) 1U servers and storage drives requires over 12 kilowatts (kW) of power. A 42U rack with 96 half-height BL p-Class blade servers, including six 1U BL p-Class power enclosures, requires 28 kW of power. As data centers try to accommodate more of these high-density racks, they are moving toward high amperage, three-phase infrastructures. Three-phase power is typically more efficient than single-phase power since it provides more than 150% of maximum available power provided by single-phase power. Few existing data centers were designed to provide this amount of cooling capacity for a single rack; and few data centers are capable of distributing adequate airflow directly to rows of such racks. Many data centers limit power consumption and cooling requirements by limiting rack density (utilization). 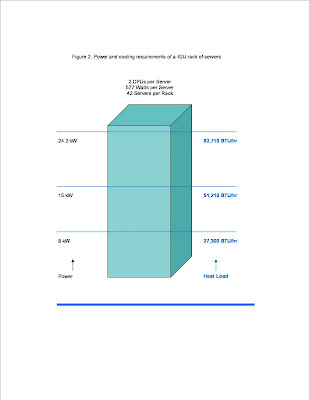 For example, Figure 1 shows the total power capacity and heat load of a fully-loaded rack of two-processor servers. (Enlarge Figures 1 and 2 for a closer look by double clicking on the image.) The figure also shows the number of servers that can be deployed per rack based on the average rack power density of a particular data center. The reasonable limit of rack power and cooling capacity for a conventional forced-air (HVAC) cooled data center is 8 kW per rack, or 27,300 BTU/hr per rack. For power densities approaching 15 kW per rack, facility planners can use advanced thermal modeling technologies to help determine the best layout of computing rooms and provisioning of cooling resources. For racks requiring more than 15 kW, the latest cooling techniques use a proven medium—water. Water can remove 3,500 times the amount of heat that an equivalent volume of air can remove. A water-chilled, closed-loop cooling system is designed for data centers that have reached the limit of their cooling capability or that need to reduce the effect of high-density racks on their facility. This type of cooling technology supports fully populated high-density racks while eliminating the need to add more facility air conditioning capacity. The rack enclosure contains three fan modules and three heat exchanger modules that slide into a cabinet mounted on the left side of the rack. Each fan module contains a variable-speed circulation fan, and each heat exchanger (HEX) module contains an air-to-water heat transfer device. Each HEX module discharges cold air to the front of the rack via a side portal. Chilled water for the heat exchangers can be provided by the facility’s chilled water system or by a dedicated chilled water unit. Most server designs use a front-to-back cooling principle. The water-chilled, closed-loop cooling system evenly distributes cold supply air at the front of the rack of equipment (Figure 2). Each server in receives an adequate supply of air, regardless of its position within the rack or the density of the rack. The servers expel warm exhaust air in the rear of the rack. The fan modules channel re-directs the warm air from the rear of the rack into the heat exchanger modules, where the air is re-cooled and then re-circulated to the front of the rack. Any condensation that forms is collected in each heat exchanger module and is carried through a discharge tube to a condensation tray integrated in the base assembly. ck space must be filled by equipment or enclosed by blanking panels so that the cool air is routed exclusively through the equipment and cannot bypass through or around the rack. Chilled water for the heat exchanger is regulated by the water group controller, a module that contains a magnetic solenoid valve, check valve, flow meter, and condensate pump. The water group is connected to the facility’s chilled water system (or to a dedicated chiller unit) with flexible 33.8-inch (860-mm) long inlet and outlet hoses. The condensate drain hose, overflow hose, and main inlet and outlet hoses can be routed through the back of the cabinet or downward into a raised tile floor. The inlet and outlet hoses are terminated with quick-connect couplings. For additional control, web-based capabilities to set, monitor, and control temperatures are easily set via an RJ-45 connector in the patch panel. The management module controls the water flow and fan speed to provide the needed cooling capacity and desired server inlet temperature as set by parameters in the web interface. The system maintains the temperature of the server intake air by opening and closing the solenoid-actuated water valve. The valve opens when the sever intake air temperature goes above the set point, and it closes when the air temperature falls below the set point, minus the Hysteresis Value3. The system controls airflow by adjusting the speed of each fan module to maintain the server exhaust temperatures at the appropriate levels. The management module can be configured to send alert traps to network management systems and other SNMP management applications if an alarm condition is detected. Network monitoring, control, and feedback capabilities are provided through an operator display on the outside of the front door and the RJ-45 network connector in the patch panel. When the management module issues an alarm or warning, the message is shown on the operator display, as well as on an alarms menu and alarm history menu in the web interface. A water-chilled, closed-loop cooling system rack requires approximately 1½ times the width and 1¼ times the depth of a standard server rack (to allow for the fan and heat exchanger modules and front and rear airflow). However, this type of enclosure has enough cooling capacity to support the heat load of a rack of equipment consuming 30 kW. This heat load is equivalent to that generated by three 10-kW racks, yet the water-chilled, closed-loop cooling system rack occupies 40 percent less floor space than three standard racks. Likewise, the system supports a heat load equivalent to 3.75 8-kW racks (30 kW/8 kW per rack = 3.75 racks) while occupying 65% less floor space and reducing the overall heat load on the facility. Previous articleWEB EXCLUSIVE: Are You Protected?